Wales and Worcester Warriors forward Jonathan Thomas has been forced to retire from rugby on medical advice. The 32-year-old won 67 caps for Wales and won Six Nations Grand Slams in 2005 and 2008. He was diagnosed with epilepsy last year which is thought to be from multiple head traumas and has led to a degree of brain injury. "I've done everything in my power to keep playing," Thomas said. "However, there comes a point when you realise you need to listen to medical experts and also do what's best for your wellbeing. "I'm keen to stress there are many different types of epilepsy and I'm fortunate to only suffer from it in a mild way compared to some. "Naturally though, it has proved too difficult to continue as a professional athlete." The 6ft 5in back-five forward started his career at Swansea before joining Ospreys, playing 188 times and scoring 14 tries for the Welsh region. Thomas joined Worcester in May 2013, captaining the English side, and signed a two-year contract extension in January 2015. In total he has played 44 games for the Sixways side. Worcester won promotion back to the Premiership at the end of last season, beating Bristol in a two-legged play-off final. "The highlight of my career has been representing Wales," Thomas added. 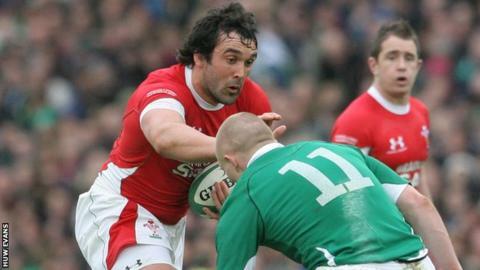 Won his first Wales cap on the summer tour to Australia in 2003 before playing in the Rugby World Cup later that year, and scored seven tries in 67 appearances for Wales. Was named in eight consecutive Six Nations squads between 2004 and 2011, featuring in the Grand Slam-winning teams of 2005 and 2008, as well as playing in a second World Cup in 2007. After starting his club career with Swansea, he clocked up 14 tries in 188 games for Ospreys before his switch to Worcester. "I grew up as a mad Welsh rugby fan and to have played with so many great players, won two Grand Slams, played in two World Cups and gained 67 caps, is something I used to dream about as a youngster. "I will always remember fondly the trophies and accolades won, but for me the game of rugby is about the people you meet along the way. "I hope I've been a good team-mate and have shared some hilarious experiences with many great lads."